The F.P. 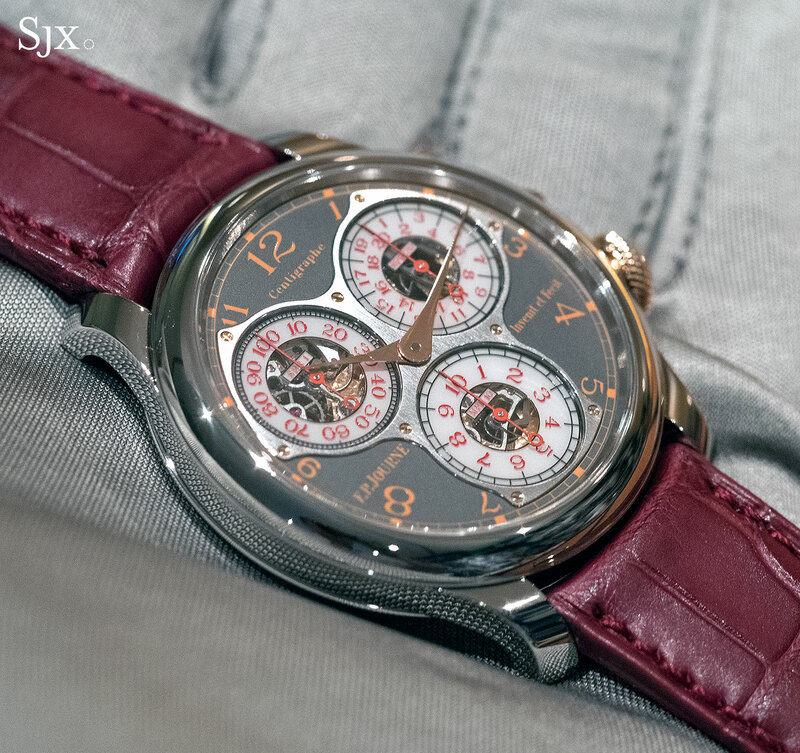 Journe Centigraphe Souverain Anniversary is slim and striking. The F.P. 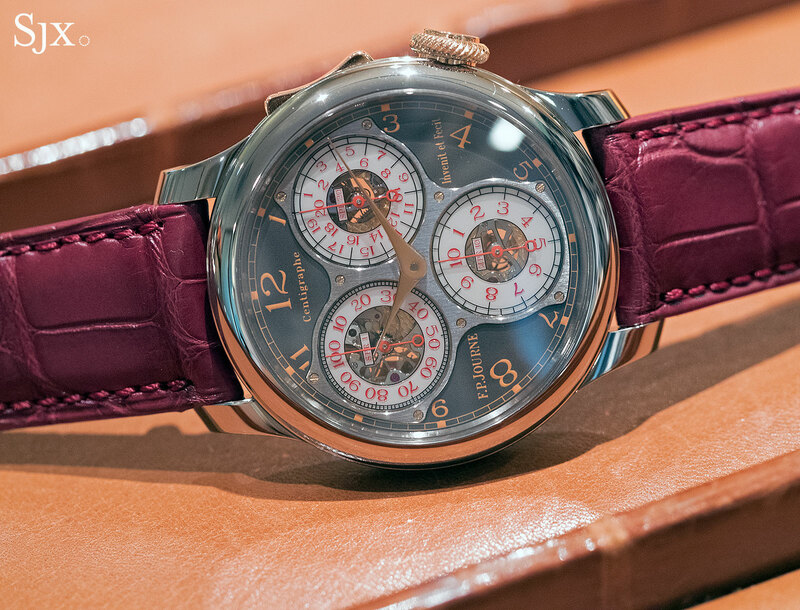 Journe boutique in Tokyo just marked its 10th anniversary with the Centigraphe Souverain Anniversaire, a limited edition that’s the latest in the brand’s series of boutique-only watches in titanium and red gold. F.P. 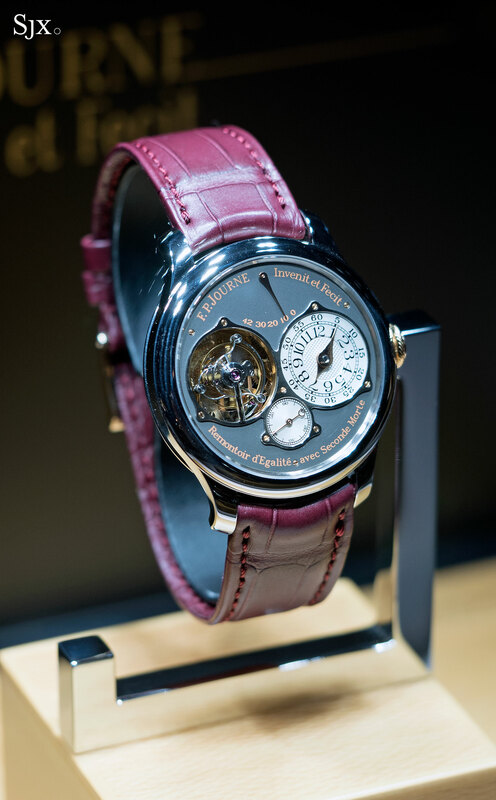 Journe has made it a tradition to mark the anniversary of its stores with limited edition wristwatches in titanium with red gold accents. The tradition began in 2005 with a titanium Chronometre Souverain to commemorate the opening of its Tokyo boutique, the brand’s first. 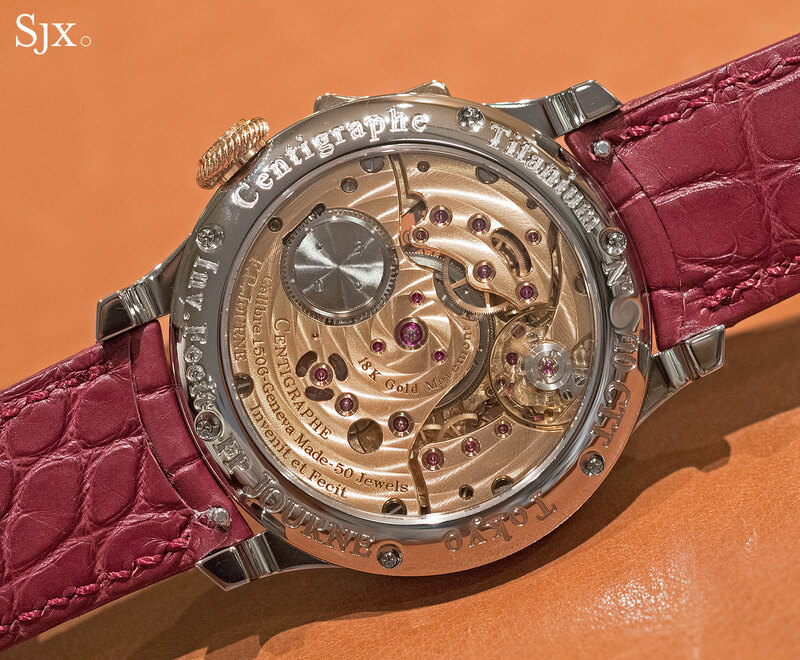 Next was a Resonance in 2006, followed by the Tourbillon Souverain in 2008, and in 2011, the Octa Perpetuelle. The latest to join the titanium boutique series is the Centigraphe Souverain Anniversary, or “CTT” for short, produced to mark the 10th anniversary of each of the 10 boutiques around the world. Each store will offer its own anniversary Centigraphe – all will be identical save for the case back lettering – when it reaches the 10-year mark, and only during the tenth year. The first shops to celebrate that milestone are Tokyo and Hong Kong. The new Centigraphe adheres to the same metal combination as the rest of the boutique anniversary watches: the 40mm case is titanium, while the crown and chronograph rocker are 18k red gold. Light and slim for a chronograph, the anniversary Centigraphe wears elegantly in a manner typical of F.P. Journe watches. But while most F.P. Journe timepieces are visually restrained, the Centigraphe Souverain Anniversary is striking in its colours and the complexity of its dial. With the burgundy strap it verges on being flashy but doesn’t cross the line. Made of a solid gold disc coated in ruthenium to leave it dark grey, the dial is has a grained, matte surface. And like all F.P. 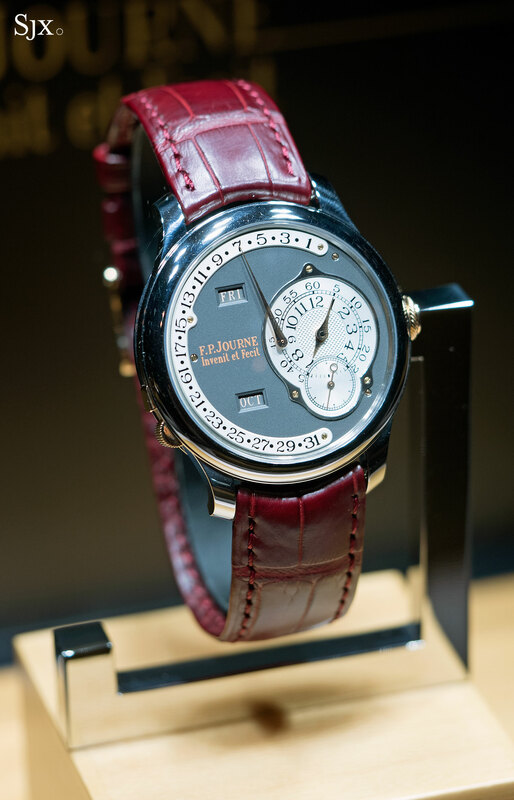 Journe dials, it is made in the brand’s very own dial factory located in an industrial suburb of Geneva. The hands are rose gold and matched with a dark orange print for the hour numerals and minute track. More unusual are the chronograph registers, which are usually silver-plated and engine-turned on the ordinary version of this watch. 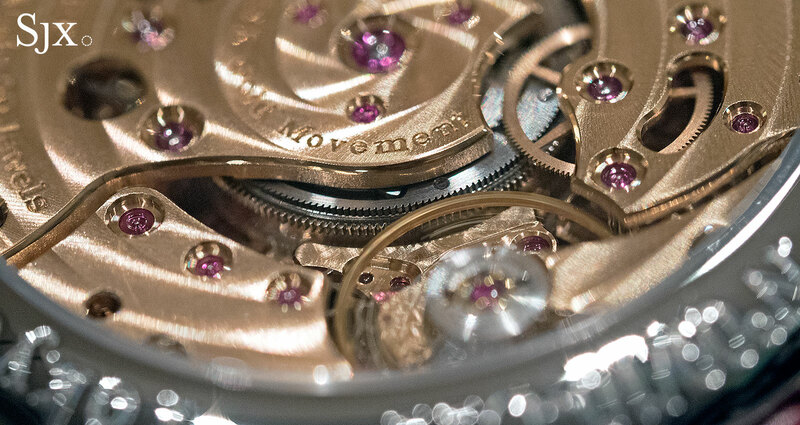 On the anniversary edition the sub-dials are see-through sapphire discs, a feature taken from the lightweight Centigraphe Sport. 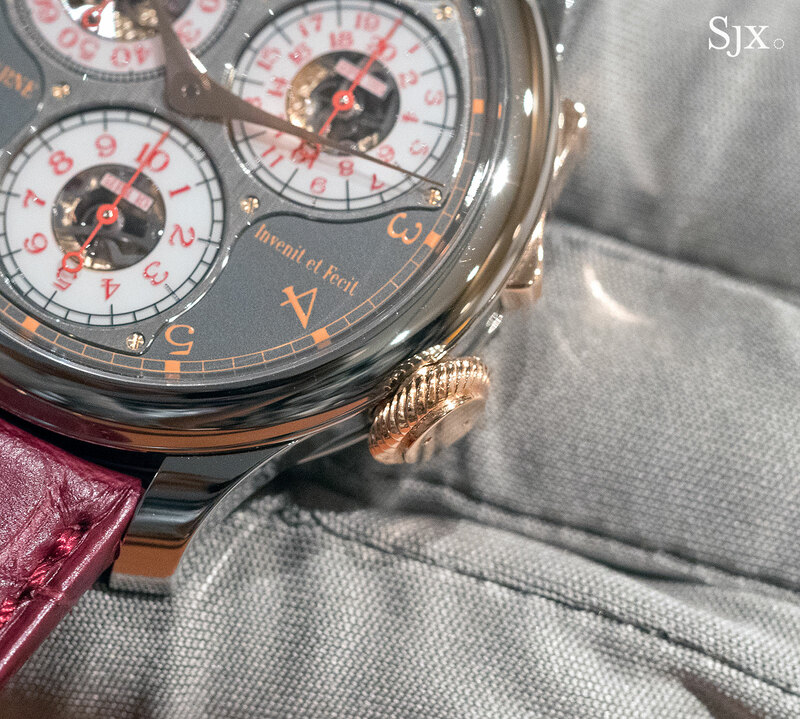 The markings on the chronograph registers are engraved and filled with red lacquer, made legible with a white printed chapter ring. 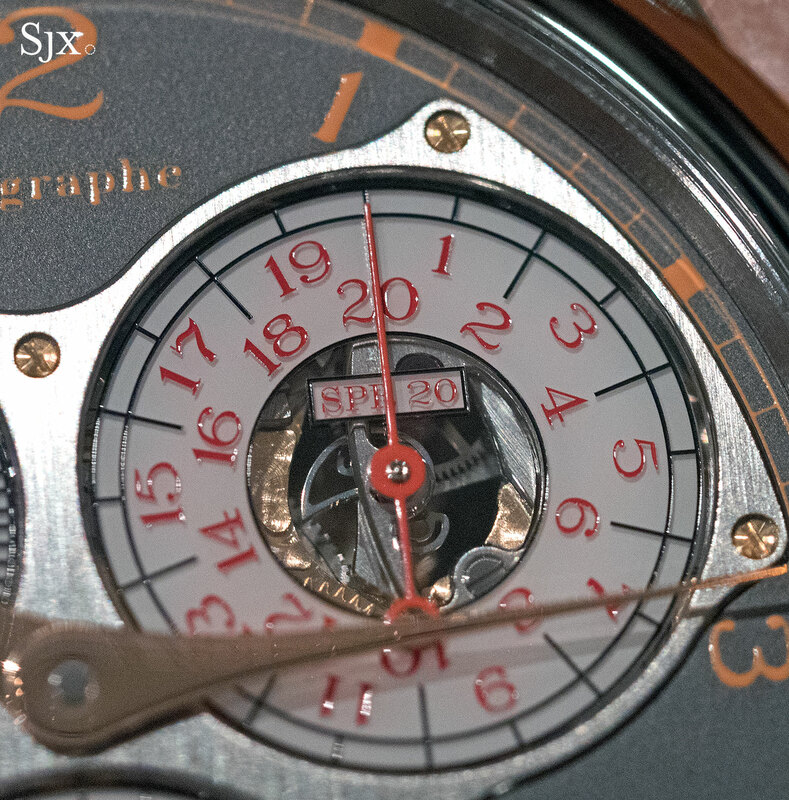 But the centre of each sub-dial is left transparent, revealing the levers and gears of the chronograph mechanism. Able to measure up to 1/100th of a second, the calibre 1506 inside is hand-wound and constructed in a highly unusual manner. The movement is laid out in a manner similar to the F.P. 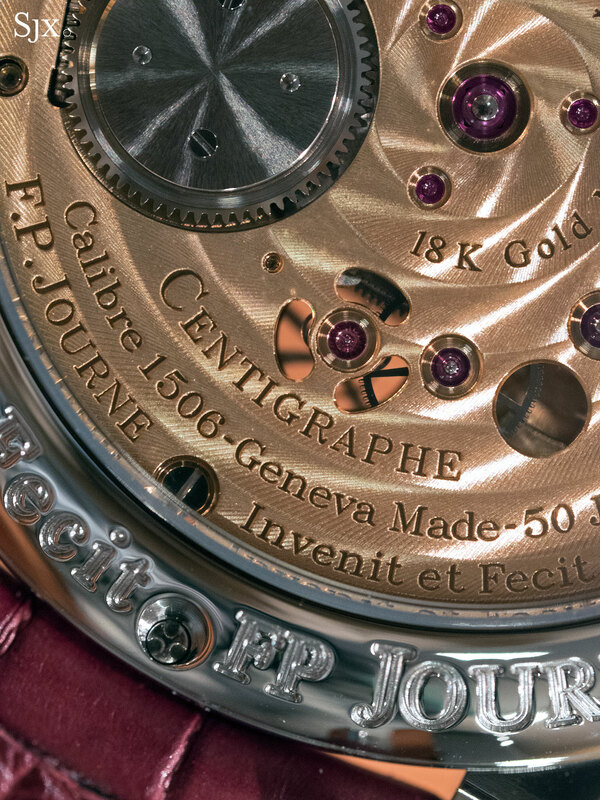 Journe grande sonnerie wristwatch, with the mainspring sitting in the centre of the movement, while the gears for the time display and chronograph sit around and above the barrel. Both the chronograph and time-telling mechanisms have their own gear train, meaning each draws on its own power supply from the barrel. As a result, operating the chronograph for extended periods has no effect on timekeeping, unlike in traditionally constructed, lateral coupling chronographs like the Lange Datograph for example. 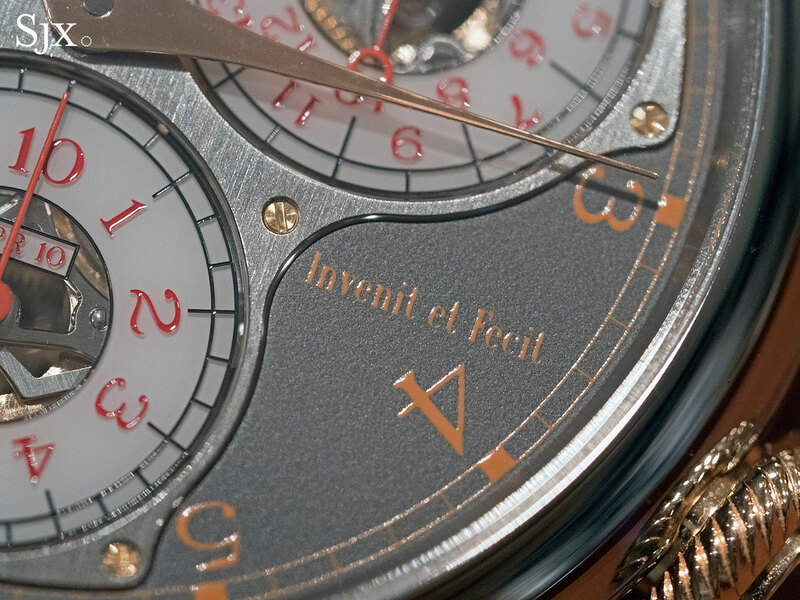 The sub-dial at 10 o’clock is a foudroyante, or lightning seconds, with the hand making one revolution every second, jumping in steps of 1/6 second. That fractional resolution is a result of the 21,600 beats per hour frequency of the balance wheel, which is 360 beats per minute and six per second. 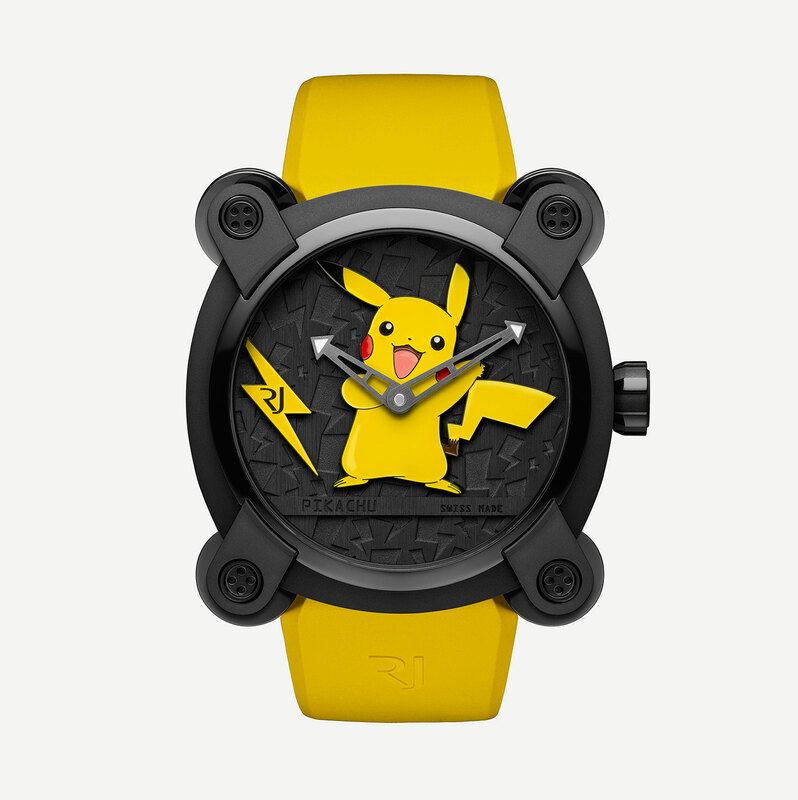 But it is theoretically a 1/100th of a second chronograph because the lightning seconds hand can be stopped at any point along the way, even in between a each sixth of a second. When the rocker is pushed to stop the seconds hand, the pinion of the seconds hand instantly disengages, stopping the hand wherever it is. That explains the rocker to start and stop the chronograph, instead of the conventional two button setup. Since start, stop and reset can all be controlled with one finger, the rocker is intended to minimise human error when operating the chronograph. 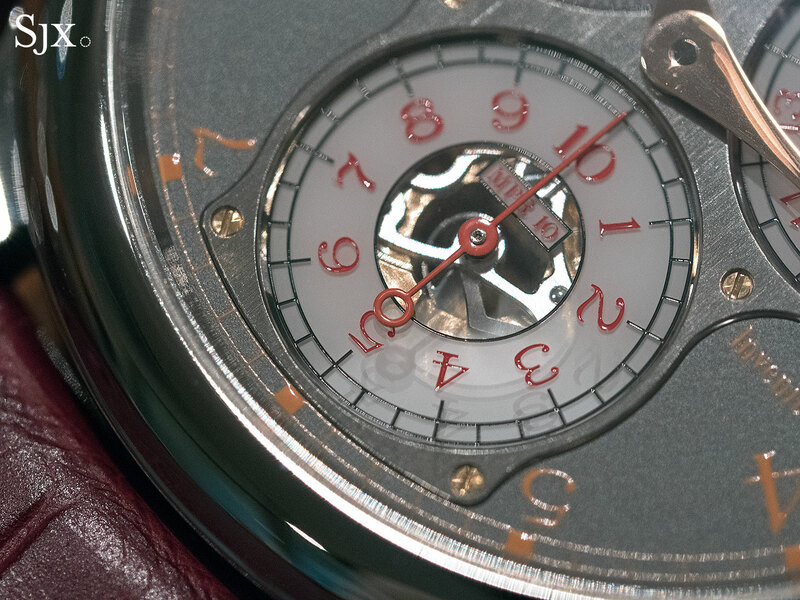 True fraction of a second chronographs -like the recent TAG Heuer Mikrograph for instance – rely on a second, high-frequency balance wheel running at 360,000 beats per hour, thus achieving 100 steps per second with the seconds hand. But such watches are inevitably bulky as a result of the very large movement. Priced at SFr62,600 before taxes, the Centigraphe Souverain Anniversary is currently available only at the Tokyo and Hong Kong F.P. 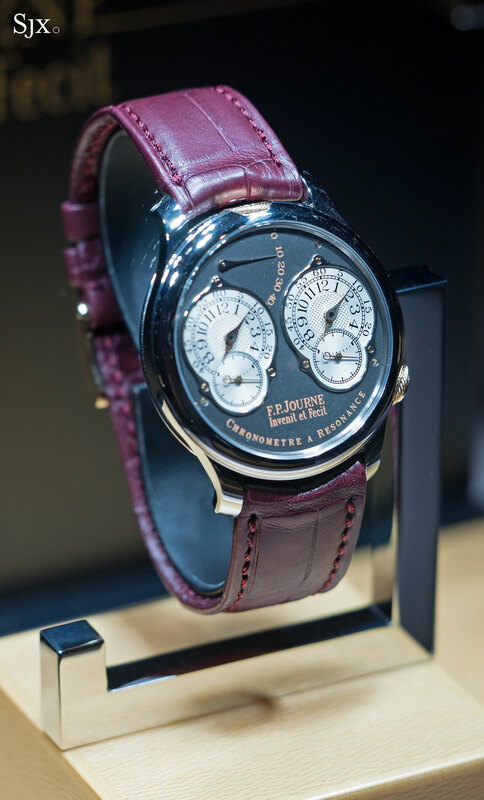 Journe boutiques, limited to 10 pieces for Tokyo and 20 for Hong Kong. All other boutiques will have their own edition in the year of their respective anniversaries, with Geneva in 2017, followed by Beijing, New York and Paris in 2018, then Bal Harbour in 2019, Miami in 2022, Los Angeles in 2023, and Beirut in 2024. 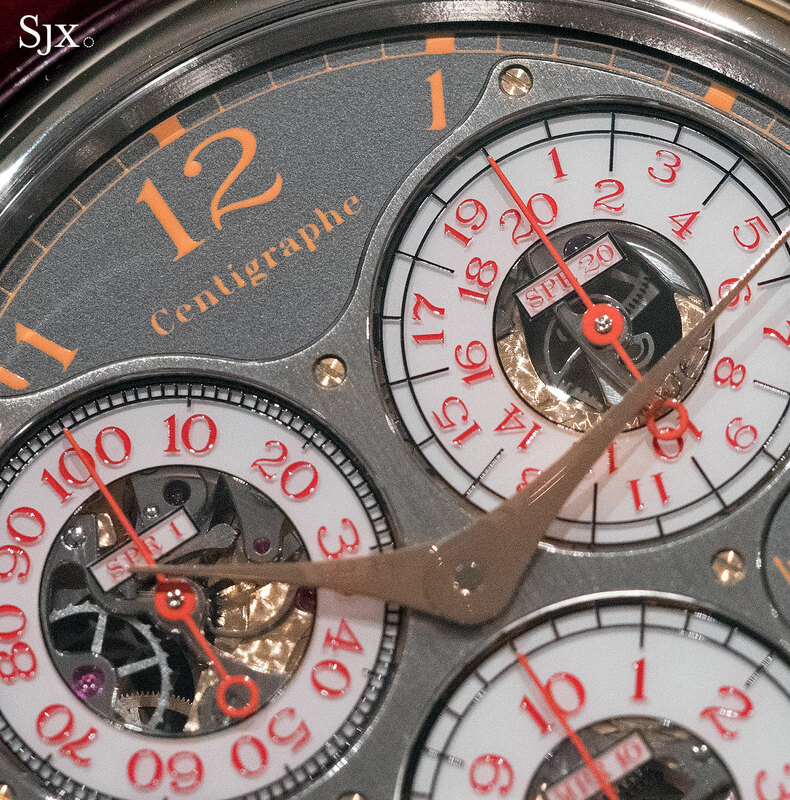 The quantity of Centigraphe Souverain Anniversary watches planned the first four cities to mark 10 years is 55 watches. And according to Mr Journe, the number of watches for the other boutiques has yet to be decided, but it will likely average 10 or per location. That means the entire run across all stores should be about 100. 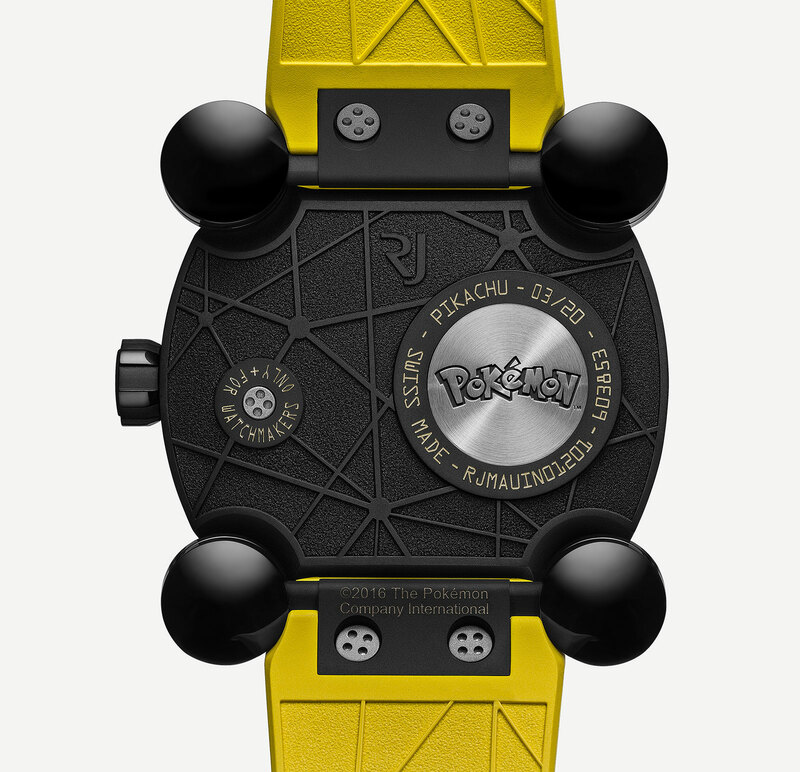 A limited edition chronograph to mark the 10th anniversary of each F.P. 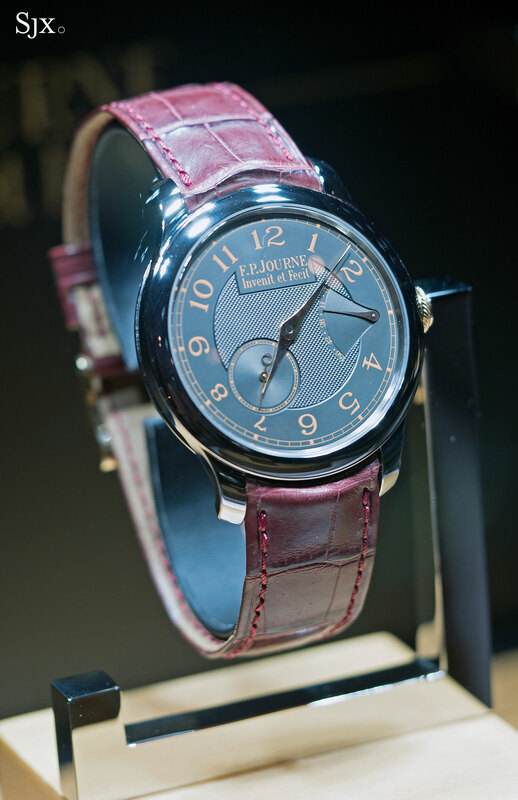 Journe boutique around the world.